Father, my heart hurts for people close to me who are enduring debilitating diseases that Satan has inflicted upon them. I know many others face the same or different issues, all of which prove difficult to cure. Only you can touch these loved ones and heal them, Father. Whether you use doctors and medicine or whether You divinely heal them, I pray you touch their lives. In the meanwhile, give them peace in the journey; comfort them in pain; let them know you stand beside them and your Spirit within them each moment of the day and night. Father, you know each of their life situations, and I lift those up to you, for you alone know what each one needs at this very moment and in the coming days as they walk through these life-changing challenges. Give them courage, strength, energy, hope and peace. Let them know your very real presence upon them. Father, if I could, I’d instantly remove each of these illnesses from them; but I can’t. I know you can. That is not a difficult thing for you, Daddy-God! However, sometimes you allow us to walk through these challenges, teaching us more about you along the way. I pray each one learns the lessons you have for them during this time, drawing them ever closer to you, Holy God. I pray your glory comes out of these situations in whatever way you choose. May you be honored and exalted; and may all these close to me – and others also – have a greater testimony of your mercy and grace in the future than they do presently. Father, I love and exalt you, for you alone are holy, high and worthy of worship. You sent Jesus to pay the price for our sins and our healing, as the Bible says in 1 Peter 2:24 (NASB) “He Himself [Jesus] bore our sins in His body on the cross, so that we might die to sin and live to righteousness, for by His wounds you were healed.” In Jesus’ precious and holy name, I ask for your mercy, Holy God. Amen. As I read this Psalm this morning, I was again touched with the love of our heavenly Father for each one of us. How intimately He knows us, far better than we know ourselves. Read Psalm 139 for yourself and rejoice in your Daddy-God’s immense love. Read it slowly and thoughtfully; let it sink into your spirit and chew on it awhile. In the description of a baby’s formation, allow the words to help you grasp how precious your whole life remains in God’s thoughts. His perfect plan for your life continues, even though you’ve made mistakes in the past. That’s what I find amazing: In spite of the long detours I’ve taken, my Daddy-God still guides my path to bring me into his will for me. I realize that’s where I’ll be most fulfilled. As the Psalm closes, let the Holy Spirit examine your heart and see if there’s anything that doesn’t fit with God’s perfect plan for your life. Let Him enable you to turn from that and seek Him with your whole heart, soul, mind and body. Then you’ll know God’s full love and joy for you. You’ll find fulfillment and joy in being the whole person your Father created you to be. I pray God’s rich blessings of realizing how vital to your heavenly Father you are and of finding His love and joy in your life. Amen. 2 You perceive every movement of my heart and soul, and you understand my every thought before it even enters my mind. 3-4 You are so intimately aware of me, Lord. You read my heart like an open book, and you know all the words I’m about to speak before I even start a sentence! You know every step I will take before my journey even begins. 5 You’ve gone into my future to prepare the way, and in kindness you follow behind me to spare me from the harm of my past. With your hand of love upon my life, you impart a blessing to me. 6 This is just too wonderful, deep and incomprehensible! Your understanding of me brings me wonder and strength. 7 Where could I go from your Spirit? Where could I run and hide from your face? 8 If I go up to heaven, you’re there! If I go down to the realm of the dead, you’re there too! 9 If I fly with wings into the shining dawn, you’re there! If I fly into the radiant sunset, you’re there waiting! 10 Wherever I go, your hand will guide me; your strength will empower me. 11 It’s impossible to disappear from you or to ask the darkness to hide me, for your presence is everywhere, bringing light into my night. 12 There is no such thing as darkness with you. The night, to you, is as bright as the day; there no difference between the two. 13 You formed my innermost being, shaping my delicate inside and my intricate outside, and wove them all together in my mother’s womb. 14 I thank you, God, for making me so mysteriously complex! Everything you do is marvelously breathtaking. It simply amazes me to think about it! How thoroughly you know me, Lord! 15 You even formed every bone in my body when you created me in the secret place, carefully, skillfully shaping me from nothing to something. 16 You saw who you created me to be before I became me! Before I’d ever seen the light of day, the number of days you planned for me were already recorded in your book. 17-18 Every single moment you are thinking of me! How precious and wonderful to consider that you cherish me constantly in your every thought! O God, your desires toward me are more than the grains of sand on every shore! When I awake each morning, you’re still with me. 23 God, I invite your searching gaze into my heart. Examine me through and through; find out everything that may be hidden within me. Put me to the test and sift through all my anxious cares. 24 See if there is any path of pain I’m walking on, and lead me back to your glorious, everlasting ways – the path that brings me back to you. Old Faithful Geyser continually erupts every day and night, all year round, never missing a time. Eruptions occur about every 70-90 minutes with park rangers giving an estimate, but only that. A tall gusher reaches close to 200 feet but often follows a shorter one. My husband and I have watched this fascinating sight many times with a couple of thousand people in late June or have seen it a few times by ourselves in December, always special to behold. The first winter I saw it, while mentally knowing Old Faithful blew all year, surprised me when I realized this great display happened with no one watching. Of course, I knew the Park didn’t turn it on for visitors, but a sudden realization hit me that it doesn’t depend on what people do. In the same way, I think we often think God’s faithfulness depends on how “good” we are. We’ve read the Bible that says He remains with us at all seasons. 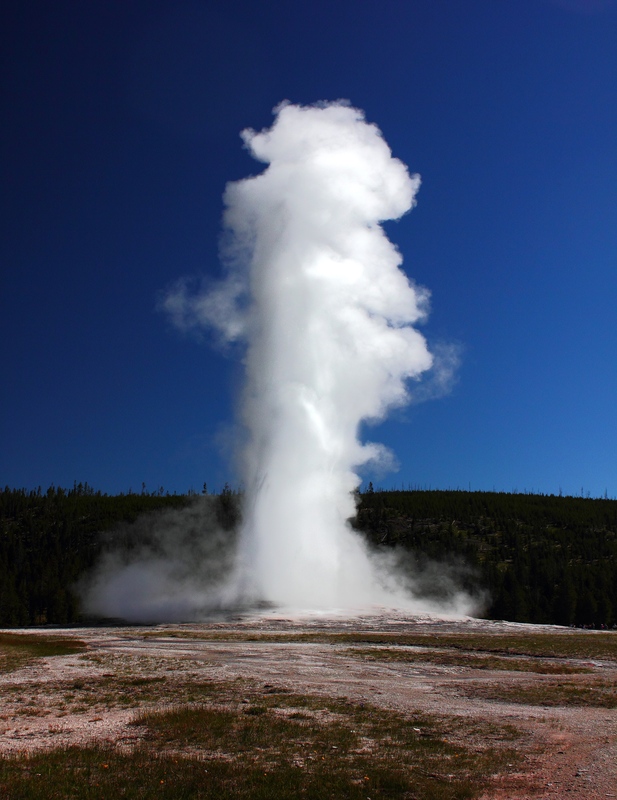 During crisis times, however, we might feel like the harsh reality of winter hit and wonder if our loving Father knows our situation, just as I realized afresh that Old Faithful operates with no spectators as well as thousands. These times call for us to draw closer to our Daddy-God so we do realize He’s present. Often we tend to pull away in unbelief, but that hinders our remaining steady during the crisis. Reviewing God’s Word helps me hold onto my faith in difficult circumstances, and these verses promise our Father’s faithfulness to us forever. All Scriptures are taken from the New American Standard Bible. Deuteronomy 32:3-4: For I proclaim the name of the Lord; Ascribe greatness to our God! The Rock! His work is perfect, For all His ways are just; A God of faithfulness and without injustice, Righteous and upright is He. Psalm 36:5: Your lovingkindness, O Lord, extends to the heavens; Your faithfulness reaches to the skies. John 14:16-18: “I will ask the Father, and He will give you another Helper, that He may be with you forever; that is the Spirit of truth, whom the world cannot receive, because it does not see Him or know Him, but you know Him because He abides with you and will be in you. I will not leave you as orphans; I will come to you. After a little while the world will no longer see Me, but you will see Me; because I live, you will live also. In that day you will know that I am in My Father, and you in Me, and I in you. Galatians 4:6-7: Because you are sons, God has sent forth the Spirit of His Son into our hearts, crying, “Abba! Father!” Therefore, you are no longer a slave, but a son; and if a son, then an heir through God. Yes, circumstances may go from bad to worse, but consider what our loving Father did: He gave his own beloved Son to die for us so we could be his children. Certainly then, He remains faithful to us throughout our lives. Situations make no difference. Our Daddy-God loves us!